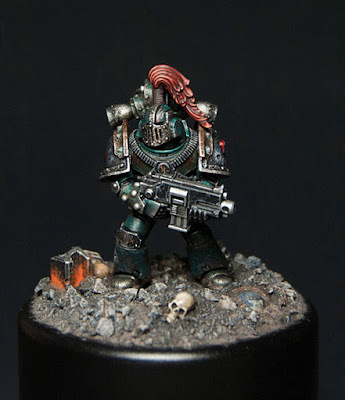 Have I mentioned that I think the Sons of Horus are my favorite Heresy era legion? I would have picked them instead of the Imperial Fists for my Calth boxset, but I feel like they are a little to close to my Astral Claws in theme and temperament. It's models like this though that make me second guess myself. This mini is just plain awesome. 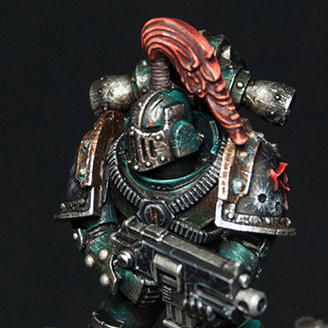 I love when space marines are painted in a super gritty, realistic style like this. The amount of tiny scratches on this guy is mind blowing to me. What's even more impressive is the consistency of quality across the whole mini on them. I think if I had painted this I would have had to spread the step alone out over several week to break up the monotony. The scale that this battle damage is done it really makes the model believable. The shade of sea green on him is great as well. Something about how the metallics are done reminds me of Jakob Nielsen's style, which I have always loved. The base is also great, with the perfect combination of paint and weathering powders. It really looks like he is walking through the ruins of Terra. My favorite part of the base is the super bright orange rust. 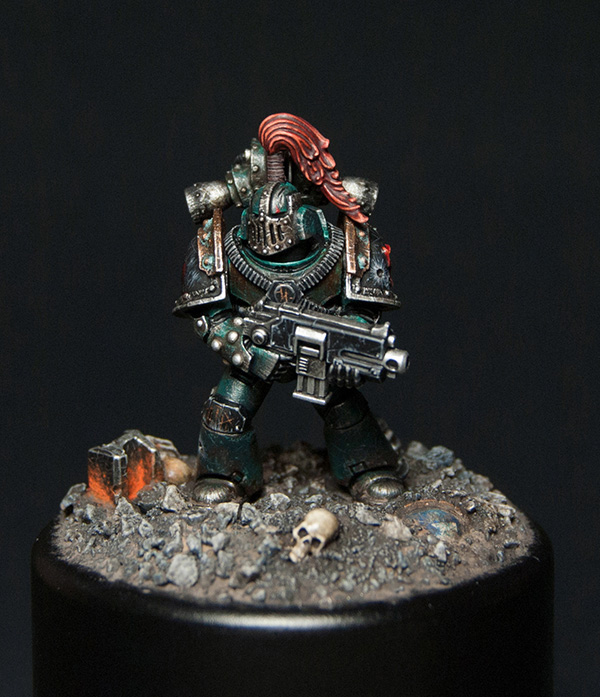 It's the perfect spot color and works great with the overall dark color scheme as well as the green of the armor. I'm not sure where that helmet came from either, but I love it. The one thing that lets me down a bit is the top knot. It's painted to just as high of a standard as the rest of the model, but the sculpting on it is much more stylized then everything else, and pulls me out of the realism a bit. This isn't the fault of the hobbyist since I'm sure that's one of the better top knots out there. The only solution I can think of is if they were to sculpt it themselves. Besides that little nitpick I really like this model. It's the perfect embodiment of the dark and brooding Sons of Horus. Mini of the Year Winner!